Lyubomir R. knows the history of malignant pleural mesothelioma, and he isn't asking for a miracle — just a fighting chance for his mother in Serbia to survive. Cannabis oil will give her that opportunity, he hopes, but only if the path for obtaining and delivering it safely is cleared. As it is now, there are hurdles to leap. 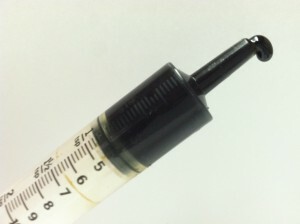 Cannabis oil is a highly concentrated, syrupy liquid extracted from the buds of marijuana plants. Its use as an alternative treatment with anti-tumor and anti-cancer properties has been growing, despite being shunned by the established medical community and stunted by various barriers of legality. "My gut tells me this [cannabis oil] is the right thing to do," Lyubomir told Asbestos.com. "But I wish we had a credible source, someone who could help me understand everything about it and exactly how to maximize its potential. There is a lot I still don't know for sure. It's frustrating at times when you're looking for answers. I would like to know more." Research shows medical marijuana, which is legal in 23 states and Washington, D.C., provides symptom relief to people with cancer and those with seizures, glaucoma, insomnia and other conditions. The support for legalizing marijuana across the U.S. is fueling that research. However, aside from clinical trials and personal accounts of the success of cannabis oil in cancer treatment, the lack of scientific evidence to support their claims makes many medical professionals suspicious. His 74-year-old mother decided against toxic chemotherapy as a treatment after she was diagnosed with mesothelioma in August and told the cancer already had spread, eliminating her as a surgical candidate. She still lives with her husband in Belgrade, Serbia, where medical marijuana is still not used legally. Lyubomir, originally from Serbia, lives and works in San Francisco, where cannabis oil is legally available to those in the state's Medical Marijuana Program who can document its need. He supported her decision to try cannabis oil in hopes she would survive beyond the typically short prognosis and have a reasonably high quality of life. "My mother believes it will work. The doctors first suggested chemotherapy, but she didn't want that. It would have broken her into pieces," Lyubomir said. "She's not a real fighter. She's a worrier. We needed something else, and we heard about cannabis oil from many, many people." Its active ingredients are cannabidiol (CBD) and tetrahydracannabinol (THC). When combined, they produce various reactions in the body on the cellular level, including anti-cancer and anti-tumor activity. The extraction process, though, is inexact, making inexperienced buyers and users unsure of what to expect. Patients may respond differently. They start with small doses of a concentrated product, allowing a buildup of steady, therapeutic amounts within the body. The key is an accumulation of waxy molecules within cell membranes, strengthening the immune system while eliminating cancer cells. "I would like to be able to talk with people who have used it, had success with it, and learn exactly how it works," Lyubomir said. "I don't mean a group hug and singing 'Kumbaya.' I'd like to better understand the chemical reactions it produces within the body." Lyubomir works in the intellectual property finance business sector for a multinational corporation. He obtained his mother's first batch of cannabis oil from a friend who smuggled it into Serbia for him. It would be illegal for him to buy in California, and take or mail to Serbia. Her treatment of choice today has put the family into a precarious position that is becoming more common today: Cancer patients who believe in the benefits of medical marijuana, but are shackled by laws that still discourage its use. "It's ridiculous when you think about it, normal people becoming criminals just trying to save the lives of family members," Justin Kander, a renowned authority on medical marijuana extracts, told Asbestos.com. "But for families without guidance, knowing what to do can seem overwhelming." Kander, of Maryland, has been involved in the marijuana extract movement for more than seven years. Two of his family members have had great success with two different cancers by using cannabis oil. He is the author of "The Comprehensive Report on the Cannabis Extract Movement and the Use of Cannabis Extracts to Treat Diseases." Kander says the report is "a collection of patients, caregivers, doctors, dispensaries, corporations, and activists that advocate for the use of cannabis extract medicine to treat serious diseases" such as cancer and others. "I've seen hundreds of success stories where people beat cancers with these extracts, both alone and concurrent with chemotherapy and radiation," Kander said. "Education is critical. Like any medicine, it is easy to handle once you understand it." Lyubomir's mother responded well to the cannabis initially, according to Lyubomir, who will travel to Serbia soon. They talk regularly. Her spirits are good. She believes it will work. But he worries about finding her oil, about dosage levels and quality of product. "This is not easy. Her health seems stable now, and she's doing well again," he said. "I don't have any doubts, but I just want to be 100 percent sure we're doing the right thing."